You are here: Home / Action Alerts / Action Alert – Happy 241st Birthday, America! We see history rewritten on an almost daily basis and this is especially evident around this time of year. Why do we celebrate the Fourth of July — Independence Day? How many even refer to today as Independence Day anymore? Americans are taught that “taxation without representation” was the reason America separated from Great Britain; yet “taxation without representation” was only reason number seventeen out of the twenty-seven reasons given in the Declaration of Independence – it was not even in the top half, yet it’s all that most ever hear and are taught in school. Never mentioned today are the numerous grievances condemning judicial activism – or those addressing moral or religious or other issues. In 1762, the king vetoed the charter for America’s first missionary society; he also suppressed other religious freedoms and even prevented Americans from printing an English language Bible. How did Americans respond? They took action; and almost unknown today is the fact that Declaration signers such as Samuel Adams and Charles Carroll cited religious freedom as the reason they became involved in the American Revolution. Even though Thomas Jefferson and Ben Franklin (two of the least religious signers) are typically the only signers studied today, almost half of the signers of the Declaration (24 of 56) held what today would be considered seminary or Bible school degrees. The greatest moral issue of that day was slavery; and after several of the American colonies moved toward abolishing slavery in 1773, the King, in 1774, vetoed those anti-slavery laws and continued slavery in America. Benjamin Franklin and Benjamin Rush promptly founded America’s first abolition society as a direct response against the king’s order. Leaders such as John Hancock and John Adams receive credit as being the source of our independence, even though John Adams himself declared that the Rev. Dr. Jonathan Mayhew and the Rev. Dr. Samuel Cooper were two of the individuals “most conspicuous, the most ardent, and influential” in the “awakening and revival of American principles and feelings” that led to American independence. More examples could be given, but you get the idea. Beginning in the early 1900’s the effort to rewrite history and create a new paradigm began. 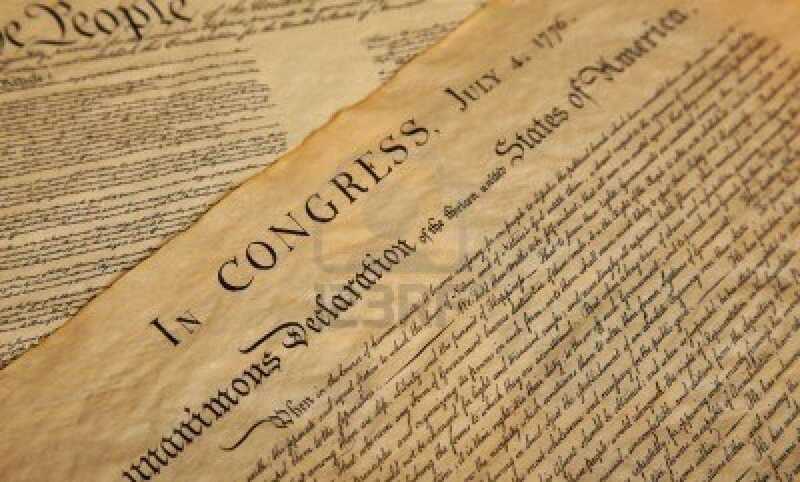 Economics would now be the only issue of importance — thus “taxation without representation” would become the sole clause in the entire Declaration of Independence American students would study! And we now see the result of this calculated attack on our nation’s founding document.